Acne can cause Melasma, or discoloration, on black skin types. The same physical characteristics that makes black skin so resistant to infection makes it very vulnerable to discoloration. The problems that come up in acne care for black skin also come up in dealing with hair removal, cuts and scrapes, and the use of all kinds of skin care products. The skin care products that work on white skin usually don’t work on black skin. Some product selections can be cosmetically disastrous. This article lists simple and inexpensive products for major concerns of black skin care. What Makes Black Skin Black? Black skin has a high concentration of the pigment-producing cells called melanocytes. These cells make the gold, brown, and black pigments that give skin its color, but that is not their primary function. The main task of the melanocytes is to make melanin, which is not just a pigment but also a skin-protective antioxidant. When the skin is injured by infection, sun, exposure to a toxic chemical, a bug bite, or a mechanical injury like a cut or a scrape, the immune system isolates the disease-causing germ or chemical and clears out the diseased tissue by releasing inflammation. Melanin puts a brake on that process, keeping inflammation from destroying healthy skin. People who have black and dark brown skin tones are blessed with an unusual ability for the skin to heal. The high production of melanin that protects the skin from inflammation, however, also can produce long-term or even permanent discoloration of the skin. 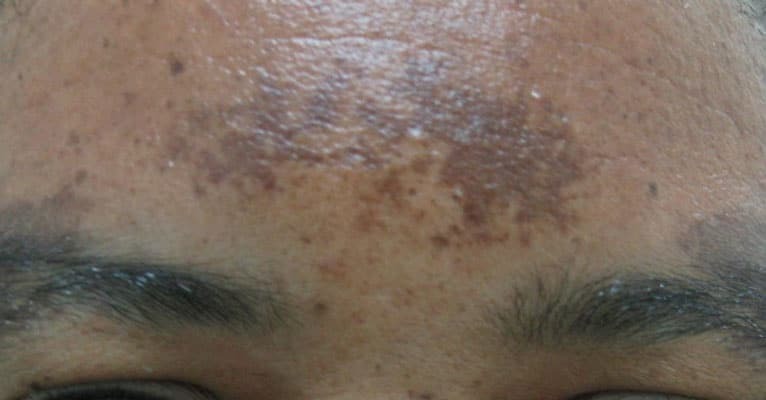 This discoloration is known as melasma. Acne, as well as cuts, scrapes, bug bites, and other kinds of skin infections can cause permanent brown and black melasma to appear on the skin. Many people who have black skin do the logical thing and try to correct those brown and black spots with skin lighteners. That’s where the real problems begin. If you were to use a product by the famous Dr. Murad, for example, you might find your skin lightener eventually makes your skin even darker. Many of the skin lightening products that are great for white or light brown skin are devastating for black or dark brown skin. The worst problem ingredient for black skin is a chemical called hydroquinone. In dark brown and black skin, there is a lot of melanin for hydroquinone to destroy. The destruction of so much melanin temporarily lightens the skin, but it causes a lot of inflammation. And what does the skin do to repair excessive inflammation? It produces more melanin! People who have beautiful, dark skin tones need to preserve their skin tones by taking a totally different approach to acne repair and acne treatment. Bad choices in skin lighteners for acne problems produce the most tragic preventable cosmetic errors on black and dark brown skin, but they are not the only problem. Let’s take a look at the problem areas in managing black skin. Dark skin develops dark spots after almost any kind of injury, including bruises, cuts, scrapes, and burns, as well as acne and skin infections. People who have dark skin usually have dark hairs. Hairs that grow in places where they aren’t supposed to be are tempting to remove, but the waxing, tweezing, and chemical depilatories can all leave dark spots. In-grown hairs also leave dark spots. This is a particular problem of men with black skin who shave. The skin on the face, especially on the nose and across the cheeks, tends to get oily. This means many dark-skinned people tend to take shiny photos. They also tend to get acne in the middle of the face where it is most noticeable. In dark-skinned people, acne starts later in life and lasts longer. While people with dark skin have just as many or more stresses than people of any other skin type, acne on dark skin seems to have less to do with stress and more to do with blood sugar problems and imbalances between estrogen and testosterone. All kinds of skin care products can make dark skin oily. This means that hair conditioners, bug repellants, sun screen, and Vaseline (even if it is not applied directly to the face it may be transferred to the face from the hands) all tend to clog dark skin. Sun block tends to leave white or purple tones on black skin. This can make figuring out makeup, especially makeup that covers up acne or acne-related skin spots, very difficult. Foundation for makeup tends to streak, sometimes making acne even more noticeable. So how on earth can anyone manage acne on black or dark brown skin? Here are some suggestions. What works for a native of Iceland usually does not work for a native of Ghana. People who have naturally dark skin tones need different approaches to and different products for skin care. There are two relatively inexpensive products that both keep pores open, preventing acne and preventing the formation of spots on black or dark brown skin. These are Aveeno Positively Radiant Cleansing Pads and Alpha Hydrox Foaming Face Wash Clarifying Cleanser. There are two relatively inexpensive toners that soak up excess oil to prevent shininess and also prevent darkening of the skin. These are Burt’s Bees Tomato Toner for Oily and Troubled Skin and Gly Derm Solution 5%. The Gly Derm Solution 5% is also good for exfoliating dry or flaky skin, should that ever be a problem. Body Shop Tea Tree Oil Facial Blotting Tissues smell nice because of tea tree oil. This ingredient stops whiteheads and blackheads from becoming pimples. It also reduces the inflammation that is so damaging to dark skin. This product is much better than other tissues for preventing shine. Even people who have black skin sometimes need moisturizers, especially around the eyes. Aveeno Positively Radiant Daily Moisturizer with SPF is a low-cost choice that actually works. Before you invest a lot of time and money in trying various skin care products, however, why not at least treat acne with a kit that contains everything you need. Exposed Skin Care offers all the products you need for acne treatment in a single kit that comes with a money-back guarantee.